I just soldered the SPI pins on top of the existing solder points… not the best idea, but it’ll do for now. What pins did you map your X and Y pins too, 40,42? Let me know if you have any issues, mine’s been stalling on the second layer (on any print). Yep that’s exactly what prusa are doing. 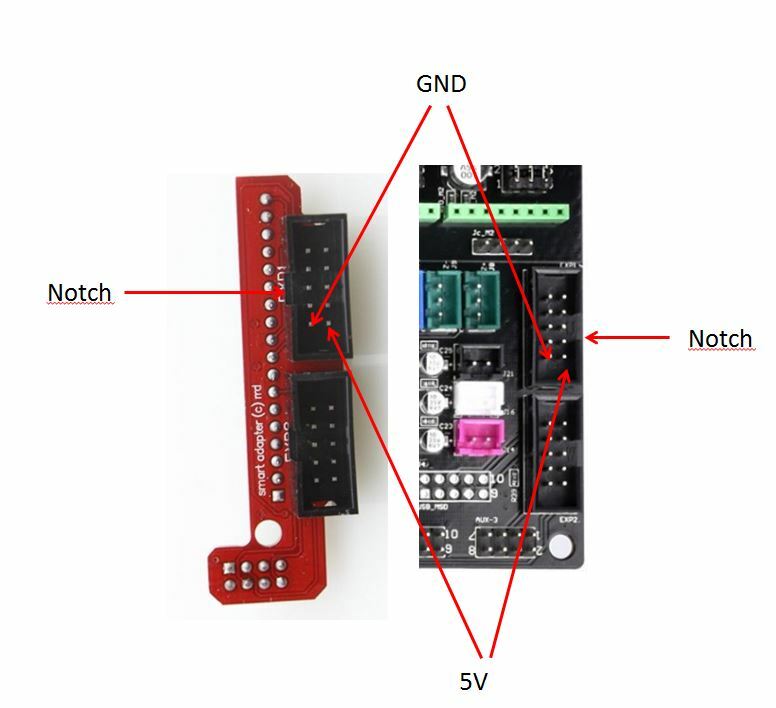 Has anyone documented how to use RAMPS with TMC2130s and an LCD yet? UPDATE: There was a splatter of solder on the pot of the driver… I had a spare, and replaced it. Now I have a different issue which I will make a new post. 49, 50, 51, 52 and 53. 50 is MISO, 51 is MOSI, and 52 is SCK. Assuming I don’t need to move these two, I only need to move pins 49 and 53, correct? From what I read, these two pins have to do with SD support. Since I do not have SD support enabled, wouldn’t you think the LCD should be showing up? Thanks, sorry for the dumb question! I am getting there!!! Thanks one more for the help. Okay, saga is over!! I got all to work!! I haven’t tried the sd card feature but after moving those pins and adjusting the firmware, the LCD was still blue… so I grabbed another pne I had borrowed from a friend, and guess what? Yep, mine was bad! Now I am waiting for heat sinks and fans, and a new LCD, and no more upgrades for a while now!!! Thanks for all the info and support! Thank you guys for sticking with me on this!!! My brain last night, and still today… feels like it is in a knot!!! It is fun though!!! I will play with this today once back home and see how far I get. It is a slow learning curve but having a direction where to go makes a huge difference!!! If all fails, I will ship this out to one of you guys!!! HAHAHAA! I will report back later on!! Thanks so much, once more!! 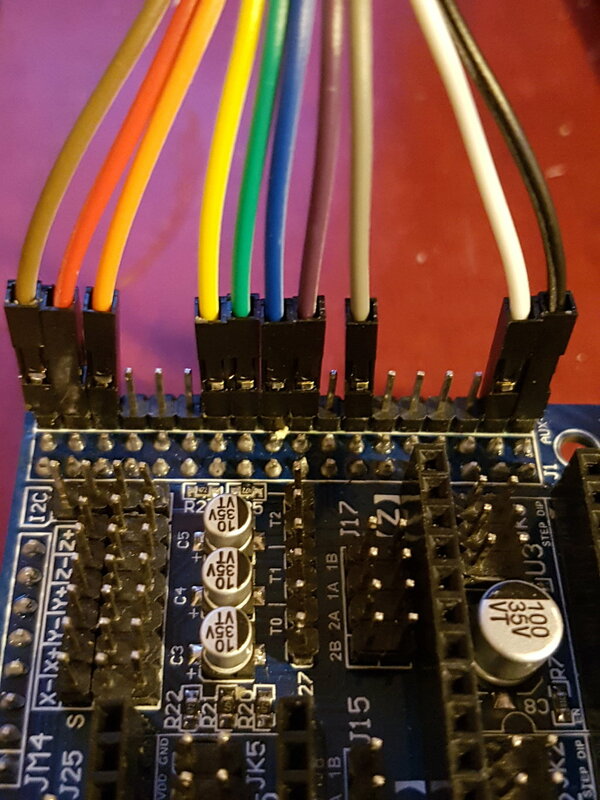 For some first tests you could always use the Arduino sketches from the TMC2130Stepper library used by Marlin and flash one of those first to get a bit of a feeling what and how is possible with those divers. So the printer is alive!! All the axis work, including extruder! What a nightmare with all the wires!! And after I got it to work, I made cleaner connectors but something was bad…had to hunt down one bad little splicer…never happens, right? I had to start with a fresh clean firmware and added one driver at a time, and bam. Now, still no LCD. I decided to first get all this working and next will be the LCD. Thanks a lot for all the help so far! I just re-read some of your last posts and noticed some warning about how not to burn your drivers… but I didn’t quite get it. Do you mean if you plug in the USB to the computer without powering the board, it will damage the drivers? If so, I did that many times. How do I check for damaged board? Or it would plain not work? Ha, spoke too soon… went to print a benchy just to enjoy the quietness of the motors and after 4 layers, for no reason, it stopped. Message through Simplify was “unresponsive firmware”. I reflashed the firmware, but now I cannot even heat the bed. Nothing works through simplify. Without panel, can’t move it that way either. On the communications tab, in simplify, It says it is connected, but cannot send any codes… bricked? Thanks for the note oakdesign. So I did cut the tab on the connectors and I have tried both in every each way possible?!!! So to be clear, I plugged both cables on the MKS with the tabs matching the notches. 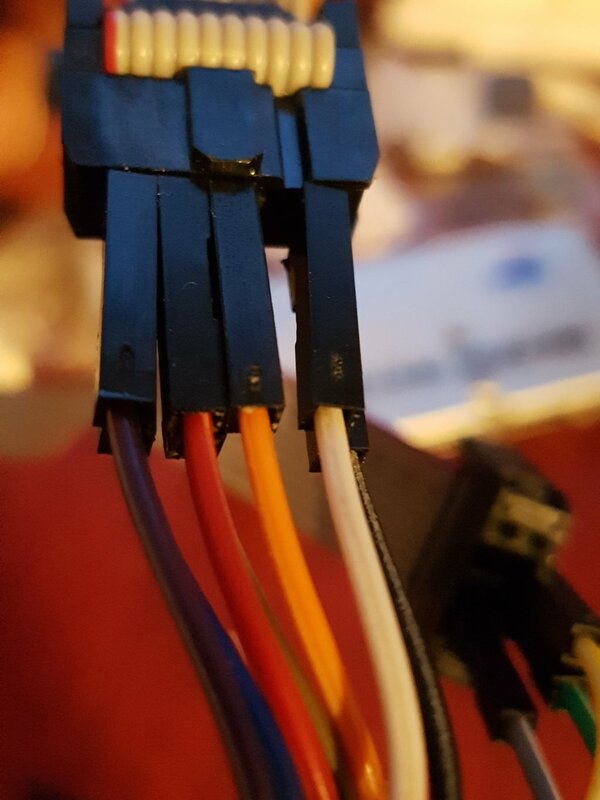 And on the end of the cables that connect to the panel, I cut the tabs off of both cables and plug them “up side down” into their connectors. And I have tried all different configurations: tabs matching the notches, criss-crossed… nothing. Now, I am still fighting my new problem from last night. This morning, after trying all the reboots and re=flashing the firmware, I was only able to get the printer back to talk to simplify was by moving the Z axis by hand, and that did the trick. So I reset everything one more time, moved all the axis around, extruder, heaters, fan… all seemed to be working perfect. I went for a second attempt to print. This time, it locked up on the second layer. But this time, my Z axis trick didn’t work. I tried activating all the limit switches and even tried to use Repetier… printer is locked up. I guess this has to be fixed first before getting back to the LCD issue. Okay, so if I understood you correctly, you are not using the ribbon cables from the LCD to the EXP1 and EXP2. Well, you have a different board than I do… And you moved it to another AUX other than AUX2 and AUX3 which is used for the TMCs drivers. 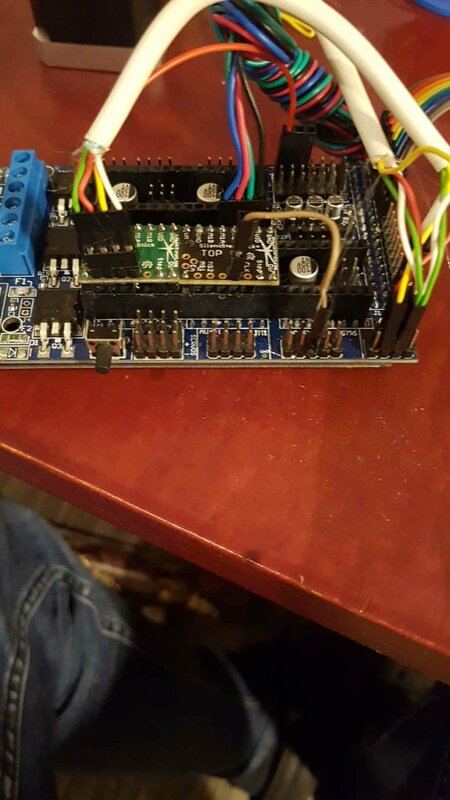 Yes i have a RAMPS and I use the LCD ribbon cable just don’t plug it on to the the board. At the moment still connected with the jumper wires as in my image. 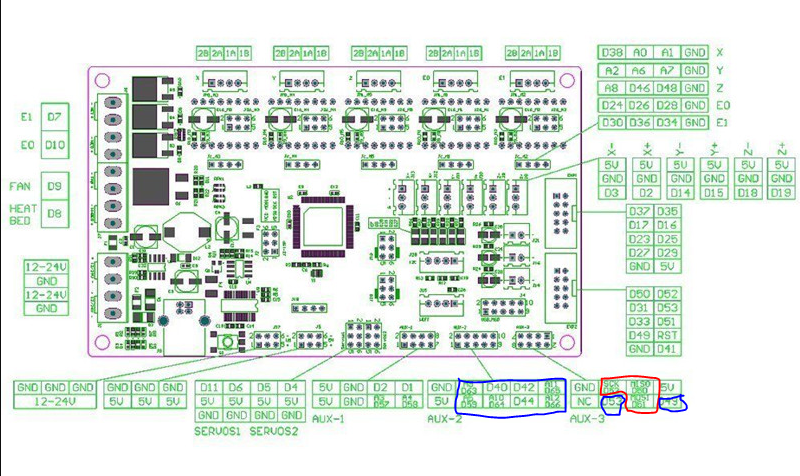 Diong some reassingment in the Marlin boards pin_XXXX.h is not that big deal best is to have a schematics with the pin layout and numbering on hand.